In Nigeria, the rules governing petroleum projects are contained in a range of official documents including the constitution, legislation, regulations and contracts. But while the constitution and laws are publicly available, petroleum contracts and some regulations are not. Petroleum contracts are fundamental documents that set out the legal framework for oil and gas projects. NRGI’s review of 23 upstream and downstream contracts in Nigeria, including 10 model contracts, shows that contracts in Nigeria contain several terms for which a strong public interest case can be made for disclosure. Publishing these contracts will create space for much-needed public scrutiny of deals that can be worth billions of dollars to the people of Nigeria. It also provides an important opportunity for the government and companies to build public trust in the petroleum industry. 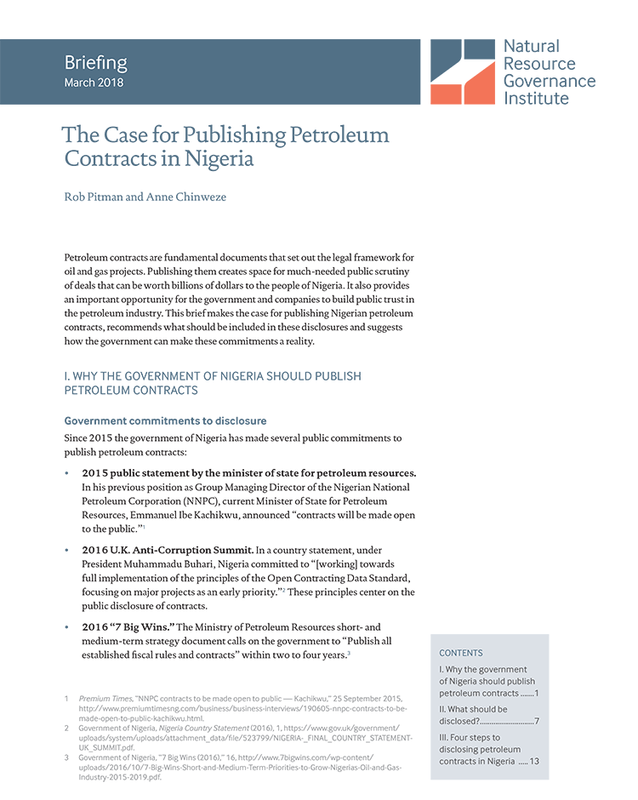 This brief makes the case for publishing Nigerian petroleum contracts, recommends what should be included in these disclosures and suggests how the government can make these commitments a reality.